Several years ago, my monkey alter ego Chuck Darwin produced a prize winning video that explained the technical nuances of digital color management: The Theory of the Evolution of Color Management. The primate scoffed at primitive humans that once used berries for ink. Well, in this video, I risk Chuck's censure by mashing and using Pokeweed berries to make ink for drawing with a feather. I loved the imprecision of using the feather. 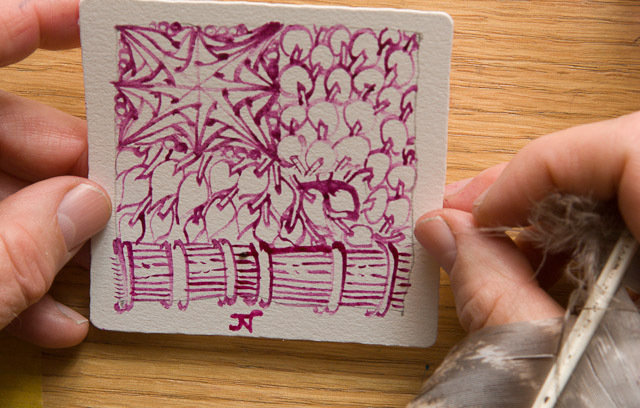 Occasionally, a chunk of mashed berry would become lodged inside my quill, leading to thick, explosive lines. Nothing like homespun art supplies. I have stockpiled pine tree sap to use in lieu of glue for an upcoming printmaking project. Stay tuned! P.S. If you find yourself inspired to mash and draw, please keep in mind that the Pokeweed berries are toxic. Wonderful just watching this - it really brightened my day. Interesting video, and beautiful phptos of the roadside. What a great video. I t really shows the essence of inspiration, Zentangle AND the poke plant. Thank you! Fantastic video! I love the color of your "ink". This was just so fun, and thank you! Brought me back to my roots... all sorts of things will leave marks! Thanks all for your positive feedback. I am grateful that my creative explorations resonate with others! Great Video John! And love the photo too! What a wonderful video. It was very inspiring. Thank you. Thank you Cheryl and Judith for the positive feedback. Ah, the mysterious inspirational force of Zentangle!